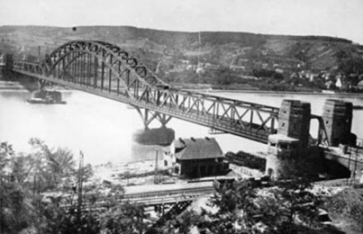 The Ludendorff Bridge (in World War II, frequently called the Bridge at Remagen) was a railway bridge across the Rhine in Germany, connecting the villages of Remagen and Erpel between two ridge lines of hills flanking the river. Remagen is situated south of Bonn. The bridge is notable for its capture on March 7—March 8, 1945 by Allied forces in the Second World War which allowed the Allies to establish a bridgehead across the Rhine. 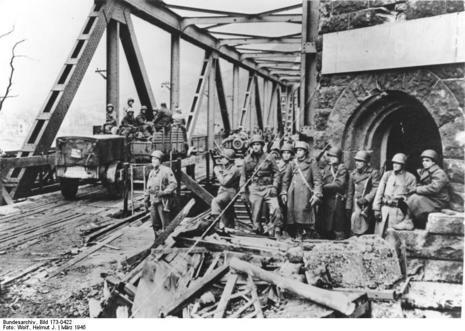 The bridge capture was an important strategic turning point during WWII because it was the only remaining bridge which led over the Rhine River into Germany's heartlands and was also strong enough that the Allies could cross immediately with tanks and trucks full of supplies. Once captured, the German troops began desperate efforts to knock it down, damage it beyond use and slow the Allies' use of it. 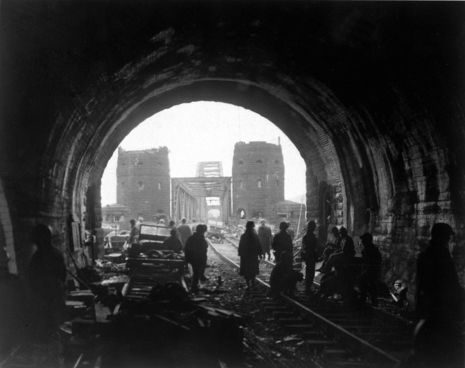 At the same time, the Allies worked just as hard to defend it, expand their bridgehead into a lodgement sufficiently large that the Germans could no longer attack the bridge with artillery, and keep it in repair despite the ongoing battle damage. The ensuing engagement went on for more than a week during which it triggered a huge artillery duel, a desperate air battle, and totally scrambled troop dispositions for both sides along the entire defensive front along the Rhine as both sides reacted to the capture. 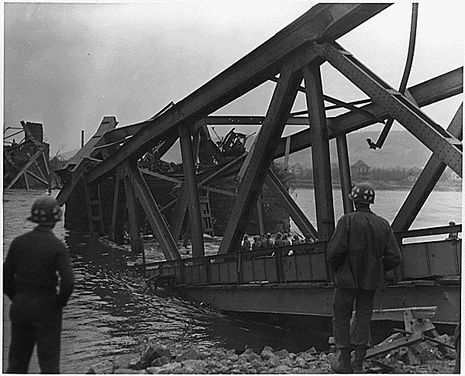 One side effect of those redeployments was that the Allies were able, within a fortnight, to establish other lodgements using pontoon bridges in several other sectors of the Rhenish front, again complicating the defence for the Germans and hastening the collapse of Nazi Germany. On 23 March the long prepared Operation Plunder under Montgomery crossed the Rhine in force to the north in around Rees and Wesel (North Rhine-Westphalia). On March 7th, 1945, a small advance party of the 9th US Tank Division, under the command of German-born lieutenant Karl H. Timmermann, successfully captured the bridge after two unsuccessful demolition attempts by the Germans. The capture is known in WW-II history as "The wonder of Remagen". 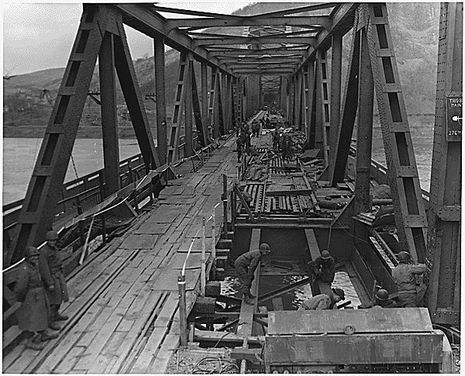 General Eisenhower proclaimed that "the bridge is worth its weight in gold".